Select your address from the drop down list to find out important and useful information about your apartment. *Electricity is included on unit 4R only. View their account standing and balance. Make one-time payments by eCheck or Credit Card. 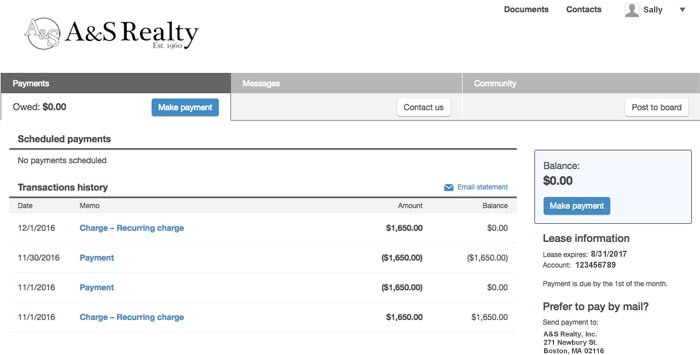 Set up recurring automatic payments by eCheck or Credit Card. Send their property manager messages and maintenance requests. Post messages to the community board to connect with other tenants in their building. View important documents such as leases, building policies, etc. View important contacts such as utility and internet companies which service your property. *Not all residents have access to the portal at this time. Please check above to see if your property is included.